RUSH: I want to take a break now. When we come back, I want to indulge you, if you please, for some personal time. Because a man died last Thursday without whom this program would not exist and very likely conservative media as you know it today would not be what it is. 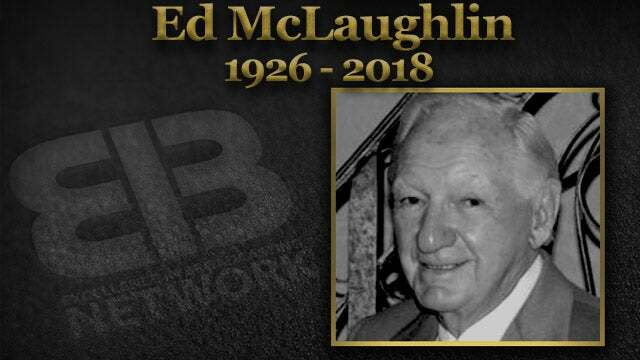 His name was Ed McLaughlin and Ed McLaughlin was the founder and the chairman of the Excellence in Broadcasting Network. The name of his company was actually PAM Media. Those are the initials of his beloved wife, Patricia. It’s been a long time since I’ve explained how this program began and how it made it, and there are many new people listening here who have not heard the story. For those of you who have, that’s why I’m asking and begging your indulgence, and I must pay tribute to Ed. Ed didn’t intend any of this; don’t misunderstand. He was one of us. But we were running a business. We were not engaging in politics when we started this program. But it wouldn’t have happened without him, in more ways than one. And I would just like to tell you a little bit about him and how all this happened so that you who haven’t heard can understand it, because to me, of course, it’s a big thing. I was driving to play golf Saturday morning — in fact, played golf with Ron DeSantis, congressman from Florida, who is running for governor, and this happens to me sometimes. I’m on the way up there and the route to this particular place takes you through, shall we say, less-than-affluent places. And each time I notice it, but today, Saturday, it really hit me how damn lucky I am and have been. So you begin to undermine yourself. There are people that do that. I’ve never had that problem, but I also am constantly aware of just how lucky I have been. And that’s why I never forget it. And any time it’s relevant, I give as much thanks to all of you in this audience as I can, because you are as much responsible for what happens here, the success of it, as anybody. Without you, it’s an academic exercise and doesn’t exist. But without Ed McLaughlin, it doesn’t either. 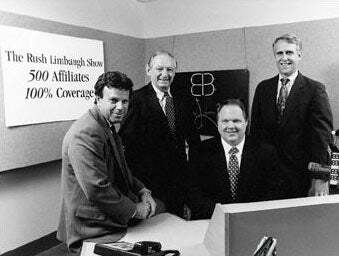 RUSH: Now, folks, Ed McLaughlin was a giant in the radio business for years. He was born in 1926. He ran one of the biggest and most important radio stations in the country, KGO in San Francisco. He built it into a decades-long era of leadership, being No. 1, top of the heap. He staffed it with the best on-air talent that he could find. His career took him to the presidency of the ABC Radio Networks. There were many networks, and he was the head honcho of all of them. He was in the same executive suite as Roone Arledge on the TV side and any of the other noted and famous ABC executives. He was at ABC in its heyday, in its period of greatest accomplishment and achievement. He was right there making that a reality on the radio side for ABC. And then ABC decided to merge with Capital Cities Communications. This merge resulted in many of the ABC executives being, quote-unquote, “retired” so that Capital City executives could assume their positions ’cause Cap Cities was the purchasing entity. Ed McLaughlin, as his retirement package, was given whatever compensation but more importantly he was given two hours of satellite time from 12 noon to 2 Eastern. Now, he was already syndicating Dr. Dean Edell. But he was given two additional hours as part of his retirement package, and he was free to do with those two hours whatever he wanted to do. The time he assumed control of those two hours they were running a show. I forget who the host was, but they were on 56 radio stations, and the largest one was probably in a market not even in the top 50. Daytime syndication of talk radio programming had simply not succeeded. That’s why Ed took one of the biggest risks anybody ever took in radio. RUSH: I’m gonna stick with the CliffsNotes version of things here because to give you every fascinating-to-me detail about the beginning of this program, I could spend an hour if not more. You have a giant in the radio business, Ed McLaughlin, who retires from ABC, and is given two hours of satellite time to fill as he wishes. That was part of his retirement package. He could have picked anybody. He could have chosen to do anything with these two hours. He could have played music. He could have done, you know, polka. He could have done Chinese opera. But he believed in the power of spoken-word radio. He believed it could win. Now, I mentioned the fact that I’ve been very lucky in life. There are any number of people Ed McLaughlin could have chosen, any number of people Ed McLaughlin could have invested in. But I, fortunately, met some people along the way, after moving to Sacramento, that Ed McLaughlin knew and trusted implicitly. And when he was looking, unbeknownst to me… I don’t know any of this is going on, but it’s happening. Unbeknownst to me, my name is on the list of people he should look into. So Ed came out to Sacramento and parked himself at hotel for a week or two and listened. I didn’t know anything about it. And then one day I got a phone call and was asked if I had any interest in meeting a man who was interested in syndicating me nationally. Now, there were a lot of hoops to jump through here. I had a contractual situation at KFBK in Sacramento that was another piece of good luck. It had an out for which this offer qualified, and that out was if I got a job offer from a station in a top-ten market, I could exit the contract to take it. But the key to that was… Folks, it was much different then than it is now. There were no daytime syndicated radio programs that had any success and by that I mean there were no big-time national advertisers. Nobody was investing money in programs like this. Back then, in 1988, CNN was the only cable network. It was strictly the three broadcast networks and the newspapers and that was it, and talk radio was a success at night. You had people doing business talk and personal relationship talk. You had Larry King overnight, but it was all nighttime. Nothing in the daytime. Those that had been tried in the daytime hadn’t succeeded. Everybody said, “Great effort, way to go,” but it just was determined that radio was local, local, local. They didn’t care… Audiences in Sacramento, for example, didn’t care what was going on in Oshkosh and vice-versa. But Ed always believed that… The Phil Donahue example. You think people watch Donahue care where he is doing that show? Do you think it matters to people? And the answer was no. The theory was that a good show could overcome all of these so-called restrictions, all these so-called formulas that were sacred, that couldn’t be violated. So it took six months to put together a deal, and I was scared out of my gourd because I didn’t think I had secured enough money to live distraction-free in New York. I needed to be distraction-free to be able to put everything I had into the program. But it was what it was. And then it began. And it took off. It took off faster and bigger than anybody had expected. It took off and exploded the way you dream about. We started with 56 radio stations, but we did not have a station in New York City — and, without that, national advertisers are not even going to notice. They’re not going to listen to your sales call. “You have to be on here in New York if you’re going to have national advertisers.” The first thing to do, then, was to find a way to be able to tell advertisers that their commercials would be heard in New York. And that’s where Ed’s experience and power and talent came in. Ed McLaughlin arranged for me to do a two-hour local show only in New York City for which the compensation was advertising availabilities. We got five minutes in each of those two hours to sell, and we could add that two-hour show in New York to all the other 56 stations, and we could tell advertisers that we were on the air in New York. Then came the problem with actual advertising sales. We were using an agency to do this that just put us in the roster with all the other shows out there. Nothing special about it. Nothing to it. There was no attention being paid. Ed had to change that. When this started expanding, Ed McLaughlin adapted to it. It became bigger than he ever thought it was gonna be. Remember, Ed is looking at this as… This was his retirement package, and it was exploding way beyond what anybody had staffed for, what anybody had planned for — and every step of the way, everything that was needed to keep it going, Ed McLaughlin provided. And at every moment of controversy, when advertisers were complaining, Ed McLaughlin never wavered a single time. He never asked me to tone it down, to change things, to do whatever to accommodate this complaint or that complaint. 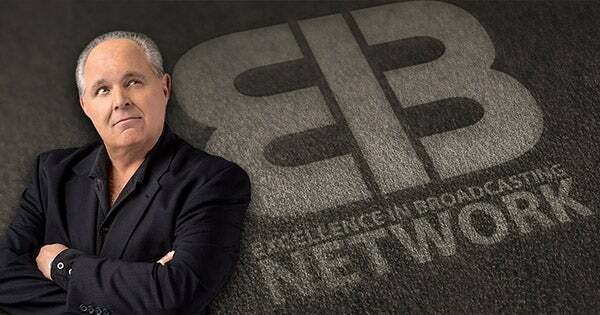 Whenever we were on the verge of getting a major affiliate such as in Los Angeles or Detroit or Chicago, one of the greatest examples of Ed McLaughlin’s brilliance and toughness and commitment… I’m not gonna mention the stations here because they’re still up and running. There are different people running them now, but I don’t want that to be a distraction. A big station at the time in Los Angeles called us and offered to pay us for the show but not air it. It’s called “shelving” it. I’d never heard of this. I said, “What is the point of paying for it and not taking it?” Ed was tempted because of the money. But why? He says, “That’s how they keep it out of the market, Rush.” “But, I mean, why are they afraid of it? We’re just now into our second or third year.” “Doesn’t matter. They can see what’s happening. They’re willing to pay us for it and never air it,” and he adamantly refused. ‘Cause, look, folks, back then, syndicated radio in the daytime was just considered the worst mistake that could be made in a local market because of the “local, local, local” business. And nobody’d ever heard of me. And the show was controversial. Who wanted this? I don’t know that this program would have made it if it hadn’t been for the backbone of Ed McLaughlin and his knowledge of the business that helped me to avoid making some mistakes — business mistakes from which, then, I learned immensely. So we held out. We did not sell the show to the guy in Los Angeles. We turned Pittsburgh down on weekends. Then there were the controversies over, you know, the usual — mean-spirited, extremist, not enough compassion — and it boggled Ed’s mind. Now, some of this was new. I mean, Ed had dealt with controversy in San Francisco at KGO, but of a different kind. This was controversy generated by a conservative running up against a liberal behemoth in the Drive-By Media and their desire to silence and stuff any effective conservative voice they find, which they still do today. And he was perplexed by it. He said to me… He’d known me by this time for three years, two-and-a-half/three years. He came to me one day and said, “You love people. You love people.” And it was… That simple little observation that he made helped me unlock a way of dealing with this. I didn’t know how to deal with it. Hardly anybody else did, either, and many people today still don’t. How do you deal with being defamed and lied about each and every day simply because of your political ideology? Look, I could go on with all of this. Suffice it to say that after three years, we were up to 500 radio stations. Everybody thinks that this program was made during the Clinton administration starting in 1993. We have over 600 stations today. We were at 500 stations before Clinton was elected. That’s how fast it grew. And then look what happened. You know, Sean Hannity was my first guest host, and he shortly… He had his own show. He shortly got his own national radio show and then Ailes hired him at Fox to do Hannity & Colmes. My TV show was ’92 to 1996. That would not have happened without Ed’s blessing. He could have told me, “No. I own you. You’re radio only.” But he didn’t. He never restricted my ambitions or desires. He promoted them. So then Fox News starts in 1997. Then conservative websites started proliferating and conservative blogs. Now there’s an entire, huge, important, crucially relevant alternative media, conservative media, whatever you want to call it. And it would not have happened, certainly the way it has happened, if it hadn’t been for Ed McLaughlin. You know, people credit me with this, but I couldn’t have done any of this if it hadn’t been for Ed McLaughlin. 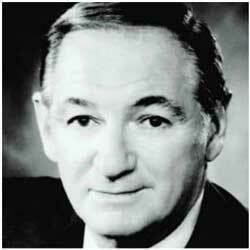 Ed McLaughlin saved AM radio by investing in it and by continuing to believe in it and believing that content was king. But he was also… There aren’t a whole lot of people… You know, once you hit 50/55, you’re pretty set in your ways, think you know how things are done. You know what the young whippersnappers are doing. You know it isn’t gonna work. They don’t know it yet. But he remained completely adaptable and open about changes that were happening and how to get in front of them and capitalize on them. I could not have had… In fact, I actually think it was because he and his wife were just two individuals who owned the company — rather than being a department of the massive corporate entity — that allowed all of the freedom, that allowed all the creativity, the experimentation. So little of it is like I ever imagined it to be. So I was unprepared for the growth and the evolution and how to maintain it and stay ahead of it. And it was all because of Ed McLaughlin and his commitment and his patience, his adaptability, his good nature. The night we got Omaha, he called me and he was just excited as he could be. It had taken us two months to get Omaha. Just at the time frame, things that were happening when that happened, it was a reason to throw a party. Every one of those deals we closed at 21. That’s what Ed did. The restaurant in New York, 21 Club, that’s where everything meaningful Ed McLaughlin ever did… It was where the contract was signed. So was this one. So that’s the CliffsNotes version of how all this started and how it survived the many early attempts to prevent this from ever happening, and it’s all because of Ed McLaughlin, who brought his own impeccable relationship and reputation to this business long before it started. But he was the guy. He was the broadcast guru and the radio greatness that I needed around me to learn from and be inspired by and protected on a day-to-day basis, and he passed away in his nineties on Thursday here in Palm Beach. RUSH: By August 1st of 2008, the 20th anniversary of this program, Ed McLaughlin had sold his founding portion of the program and had moved into semiretirement. He spent a lot of time working on a foundation that helped people in radio who had fallen on hard times — in broadcasting, in fact, who had fallen on hard times — through the Radio Network Association — The Paley Center, I think it was, in New York. At any rate, he called. He was one of the people on the 20th anniversary program who phoned in congratulations, and I wanted you to be able to hear him, hear what he said to me on that day. MCLAUGHLIN: Hey, Rush. This is Ed McLaughlin. Congratulations! It’s been an incredible 20 years, and you deserve what you’re getting today, all of these wonderful accolades. Actually, Rush, our anniversary goes back a little earlier by a few months, when we first met in San Francisco to talk about syndicating your program. You’ll recall how important it was for us to acquire a New York affiliate, and fortunately for us, the program director of WABC recognized your talent, and we were off and running. Rush, I think we were all a little surprised by the effect you had on the radio audience. I always enjoyed listening to young listeners recalling how they discovered you and how much they learned from your show. Rush, you always said you’d keep doing radio as long as it was fun. So may it be fun for many years to come. My best. RUSH: That’s Ed McLaughlin, who passed away on Thursday. That was August 1st of 2008. That comment about “fortunately for us, the program director of WABC recognized [my] talent,” that’s not quite true. Ed McLaughlin had to tell them (chuckling) how good I was, and he had — because of his experience running the ABC Radio Networks — a little leverage, and he pulled it off.